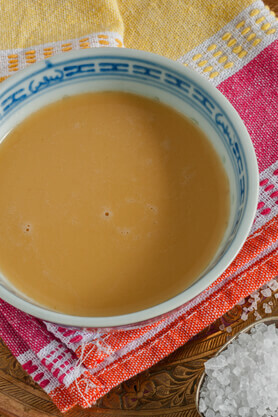 Butter tea, known as Po cha in Tibet, is made from churning tea, salt and yak butter. The tea used is a particularly potent, smoky type of brick tea from Pemagul, Tibet. A portion of this brick tea is crumbled into water and boiled for hours to produce a smoky, bitter brew called chaku. This is then stored until used to make butter tea. To make a serving of Po cha, some of the chaku is poured in a wooden cylindrical churn called a chandong, along with a hunk of yak butter and salt and churned for a couple of minutes before serving. Po Cha is consumed several times a day, every day, by Tibetans. There are many benefits associated with drinking po cha, especially in high altitude areas like Tibet, because of its warming quality and high calorie count, which keeps energy levels up. The butter from the drink also helps prevent chapped lips – another valuable benefit on Tibet’s windy, exposed steppes. It is also believed that the tea used aids digestion, keeps the mind focused, and promotes a healthy cardiovascular system. Care to give it a try? Butter tea is not for the faint of heart, but might be just the thing for your next expedition! The authentic ingredients used to make po cha are hard to be found outside Tibet, but you can still get a close taste using the following recipe. Bring the cups of water to a boil, and then turn down the heat. Put the 2 spoons of tea in the water and continue to boil for a couple of minutes, then strain. Combine the tea, salt, butter and milk or half and half in the blender and blend for 2-3 minutes – the longer the better.